When a corporation is planning a complete IT refresh; securely and safely disposing of those assets can be a significant challenge. Your organization's most valuable data may be at risk during this process. Every storage device may have recoverable corporate intellectual property on it; or worse, your clients' private information; this is a tremendous corporate liability. A key decision on sanitization is whether the media are planned for reuse or recycle. Often, some forms of media are reused to conserve an organization’s resources. If media are not intended for reuse either within or outside an organization due to damage or other reason, the simplest and most cost-effective method of control may be destruction. However, if reusage is a possibility then cost savings can be substantial, either by reducing new purchases, or by yielding return on retired assets. 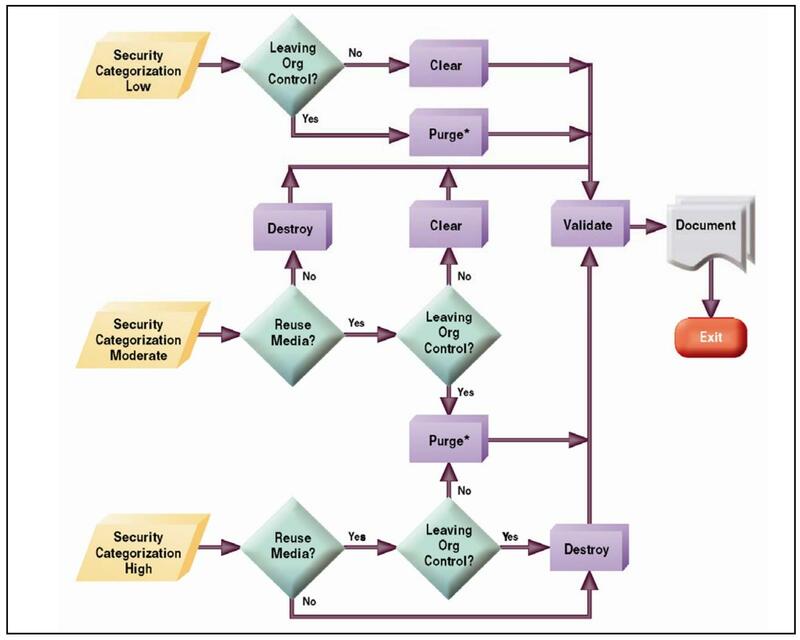 Organizations can use the decision flow diagram below to assist them in making sanitization decisions that are commensurate with the security categorization of the confidentiality of information contained on their media. The decision process is based on the confidentiality of the information, not the type of media. Once organizations decide what type of sanitization is best for their individual case, then the media type will influence the technique used to achieve this sanitization goal. DiscTech's secure data erasure, and disk destruction services are available in many levels, depending upon our client's needs and the risk category of each project. We offer value-oriented disk purging up to maximum security DOD & NIST & FIPS compliant erasure. This ensures the appropriate level of data security is maintaining, whilst minmizing the client's costs. For the most stringent security requirements we offer degaussing and disk & SSD shredding services. This is a requirement for devices containing Top Secret classified content.